The National Drought Mitigation Center at the University of Nebraska-Lincoln and the Robert B. Daugherty Water for Food Global Institute at the University of Nebraska are co-leading a $4 million research effort with the Dubai-based International Center for Biosaline Agriculture. The project is designed to help the Middle East and North Africa region balance water consumption and increase agricultural productivity, with a focus on drought management. The U.S. Agency for International Development is funding the MENA Regional Drought Management System project through March 2017, with $1 million dollars designated for research activities conducted by the NDMC, Water for Food Institute and UNL's Center for Advanced Land Management Information Technologies. The project has two major parts: improving drought-monitoring information and working with stakeholders across the water-scarce region to understand how this information can enhance decision-making, said Michael Hayes, NDMC director and principal investigator for the project. "This project is a great opportunity for the University of Nebraska to capitalize on our strengths related to drought, water efficiency and remote sensing in the region," he said. Researchers include a team of experts from the drought center; Brian Wardlow, CALMIT director; Christopher Neale, Water for Food director of research; and collaborators from the University of Maryland and the USDA Agricultural Research Service. Together they are developing composite drought indices for the region that countries may use to improve planning. Composite indices incorporate data collected from satellite remote sensors with data collected on the ground. Scientists at the International Center for Biosaline Agriculture are generating monthly maps. "Our role is to produce the daily, satellite-based evapotranspiration product," Neale said. With support from UNL's Holland Computing Center, Neale and the project's collaborators analyze the data and provide it to planners who use it to calculate the water balance within watersheds and estimate water productivity at field scales. Learning to predict crop yields based on field-level evapotranspiration and improve water productivity is an urgent need for agriculture in areas of the world that are chronically water-stressed. Rachael McDonnell, head of the Climate Change Modeling and Adaptation Section at the International Center for Biosaline Agriculture, said, "The partnership between the University of Nebraska-Lincoln and ICBA is invaluable in bringing together international and MENA regional expertise to empower local decision makers to better manage droughts in these water-insecure countries." While monitoring tools are being developed, the NDMC and International Center for Biosaline Agriculture are focused on helping governmental agencies and commodity groups better understand the water needs of the MENA region as well as its drought vulnerabilities. The agriculture research center has been conducting stakeholder needs assessments in each country. The findings will be presented at town hall-style forums planned for Tunisia, Morocco, Lebanon and Jordan from September through November. Insights gained from those meetings will help improve the effectiveness of tools developed during the project. The project involves close collaboration with several United Nations activities and organizations, including the Food and Agriculture Organization. The Middle East and North Africa region has the lowest level of renewable water resources per capita and the highest proportion of water withdrawals, compared with other major regions of the world. 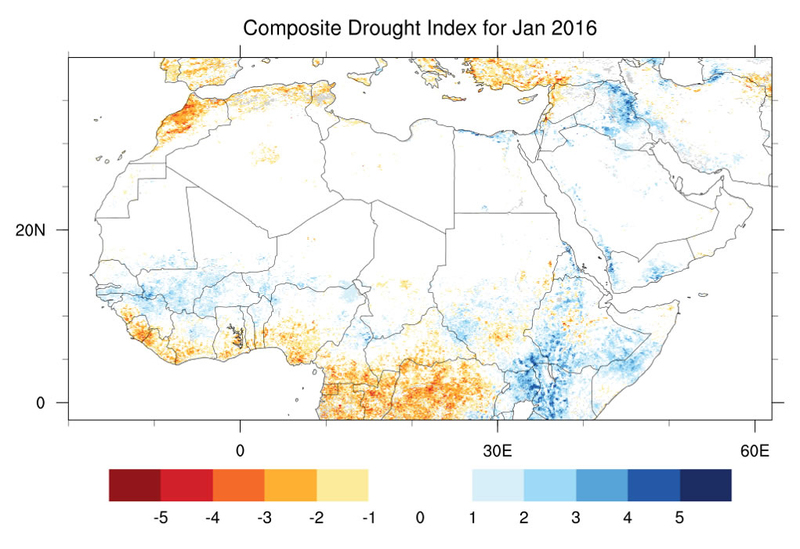 Three University of Nebraska centers have worked together to create the Composite Drought Index for the Middle East and North Africa region as part of a research project funded by the Dubai-based International Center for Biosaline Agriculture. The three centers are UNL's National Drought Mitigation Center, the University of Nebraska's Robert B. Daugherty Water for Food Global Institute and UNL's Center for Advanced Land Management Information Technologies. This work also involves researchers at the University of Maryland, the USDA Agricultural Research Service and the International Center for Biosaline Agriculture.